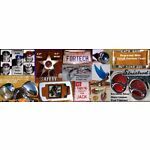 FORTECH Automotive Accessories for the Motoring Enthusiast. "Goodies" for: Custom Cars, Hot Rods, Vintage Classics. Daily Drivers. Pick Ups to Big Rigs. Motorcycles: Mild to Wild. Bikes, Boats... you name it. Please take a look at my positive feedback. 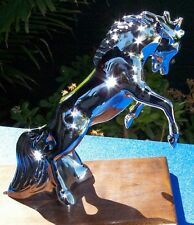 FIGHTING MUSTANG STALLION Horse Chrome Metal HOOD ORNAMENT. New and Beautiful. 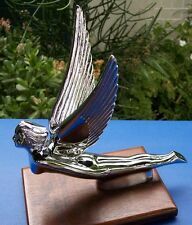 Replacement pair of BLUE Acrylic WINGS for Chrome Hood Ornaments. New. 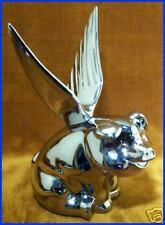 Replacement pair of AMBER Acrylic WINGS for Chrome Hood Ornaments. New. 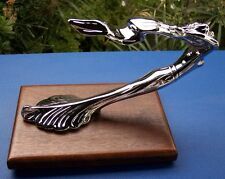 Replacement pair of GREEN Acrylic WINGS for Chrome Hood Ornaments. New. S.S. VISOR STYLE SIGNAL / MARKER LIGHTS. Chrome PAIR. Replacement pair of DARK PURPLE Acrylic WINGS for Chrome Hood Ornaments. New. Replacement pair of RED Acrylic WINGS for Chrome Hood Ornaments. New. SHIFTER KNOB Genuine 8-BALL w/ Metal Thread Adapters. New & Authentic. 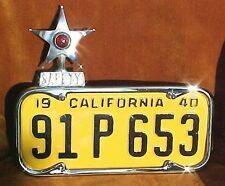 2-1/4"
ALUMINUM Show Chrome License Plate Frame w/ LIGHT Deluxe. Beautiful. CRYSTAL Halogen HEAD LIGHTS, 7" Round. VINTAGE UPGRADE. Deluxe Motorcycle License Plate Frame. Hidden Bolts, Heavy Show Chrome. Primo! Slimline Chrome Steel LICENSE PLATE FRAMES. Set of 2. CAMARO Engraved CHROME LICENSE FRAME w/ Vintage Logos. Chrome over solid brass.